Robert I. Coats, age 83 of Sterling, died Sunday, December 22, 2013 at Coventry Living Center in Sterling. Bob was born on March 25, 1930 in Jordan Township to Robert R. and Veva N. (Finkle) Coats. He married Bernadine A. Waldschmidt on August 25, 1951. 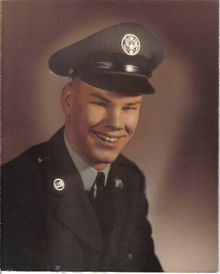 Bob served in the United States Air Force as a communications expert. He was stationed in several U.S. locations, as well as Japan, France, Korea, and Turkey. He retired as a Senior Master Sergeant after 27 years, 1 month, and 10 days of service. He and Bernadine then returned to Sterling. In retirement, he maintained the family farm. Bob was proud of his association with the Boy Scouts as a youth and as a Scoutmaster. He enjoyed woodworking, and going to breakfast at the Family Table. He loved to tell stories and even wrote a book called, "This is My Story and I'm Sticking with It". Bob was a lifetime member of East Jordan United Methodist Church. Survivors include his wife Bernadine of Sterling; two sons, Benjamin A. Coats of Antioch and Bradley A. (Debra) Coats of Florissant, MO; two granddaughters, Sarah and Katherine Coats; one brother, Russell F. (Virginia) Coats of Lebanon, Ohio; one sister-in-law, Misako Coats of Dixon; many brother- in laws, sister-in-laws, nieces and nephews. He was preceded in death by his parents and two brothers, Thomas E. and James D. Coats. Visitation will be Friday, December 27, 2013 from 4:00-7:00 P.M. at the McDonald Funeral Home in Sterling (505 1st Avenue). Funeral service will be on Saturday, December 28, 2013 at 10:30 A.M. at East Jordan United Methodist Church in Sterling with Reverend David Jungnickel officiating. Burial with military honors will be at East Jordan Cemetery. A memorial has been established to the East Jordan United Methodist Church, Toys for Tots, or Sterling American Legion.